Xkcd takes on global warming. A tiny, tiny fraction of the Xkcd comic. Look below and to the left of the text of my article below to see the comic to scale, and click the image to see the whole thing. My friend Randall Munroe is a wonder. He is more than just ridiculously smart; he knows how to access all that wonderful knowledge stored in his brain, combine various pieces of it, and then present it in innovative ways that somehow make complex issues easy to understand, and even fun. In a recent issue of his web comic Xkcd he tackles global warming, and literally turns it sideways. For example, as we come out of the last ice age 19,000 years ago, the ice melts due to changes in the Earth’s orbit (called Milankovitch cycles), allowing more sunlight to hit the poles. The increase is slight, but this is all that’s needed for a feedback loop to release more carbon dioxide into the atmosphere. This then accelerates the temperature increase and the ice melting. A lot of climate change deniers muddy this idea, asking why temperatures go up before CO2 abundance does, when scientists claim it’s the other way around. But the deniers ignore the well-known reasons that temperatures started going up a little bit first, and how that triggers more CO2 release. 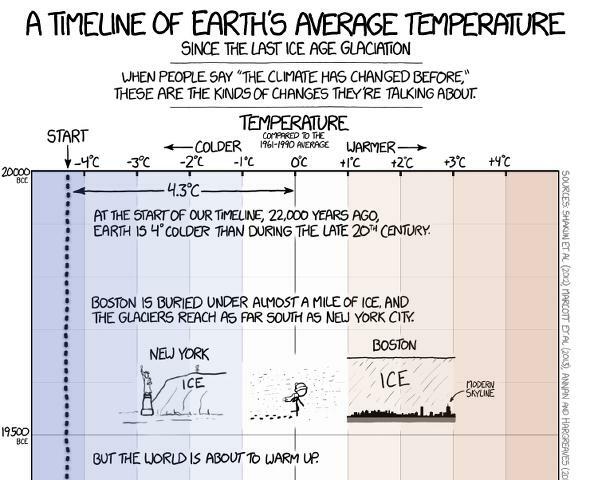 But to me, the most important thing Randall did in this comic is to beautifully show how rapidly the Earth is warming. The increase in temperature is pretty slow, with the dashed line of temperature moving left to right subtly as you scroll down. But then, finally, after nearly 15,000 pixels of scrolling down, you can see the temperature take a sudden sharp surge to the right, showing the painful and very recent upturn in heat stored all over our planet. It’s a slap in the face. This isn’t the first time Randall has tackled global warming in an Xkcd comic, but it’s certainly the most astonishing. His way of thinking turns normal thinking on its head, and forces you to see things as he does. I wish we all could do this, all the time. The world would be a far better place.